Good news for all you freelance writers out there . 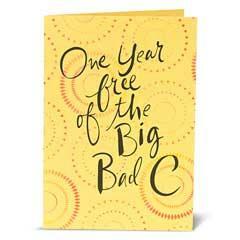 . . Hallmark announced this week that they are expanding their greeting card line. Not content to churn out trite sentiments and pithy rhymes for birthdays, deaths, wedding, bar mitzvahs, friendship, love, thinking of you, congratulations, good luck, sorry your dog died, and all the major secular and religious holidays, Hallmark did what most $4 billion dollar a year companies do: they went looking for new markets. Now, a big company like Hallmark can bring a lot of resources to bear on any problem that it faces. So, they decided to send out 4,328 employees to hang around shopping malls in dark glasses, hats and long trench coats. These employees were tasked with gathering information about what people felt they were missing in a greeting card. The result was fairly predictable: 2700 employees were arrested and 14 malls were closed down when shoppers called their local SWAT team. Of course, I'm joking. Hallmark is a sophisticated company that can pay someone else to do their research for them. Or, as they say in the marketing industry, "poll some focus groups." As it turns out, a focus group is a lot like improv comedy. Members of the focus group are asked to give spontaneous responses to questions they've never heard before. And, like improv, the results are unpredictable and often hilarious . . .
Hallmark announced that the "majority of online and focus group respondents said they couldn't find what they were looking for when needing an encouragement card." In other words, when people didn't want to take the time to compose a heartfelt e-mail to a life-long friend recently diagnosed with leukemia, they were pissed that they couldn't assuage their guilt by making a five minute stop in the mall and plunking down $3.95 (plus tax). By way of full disclosure, I will confess that I am not normally a card person. I don't feel like I need a card to let someone know how much I care about them. That's what gift certificates to McDonalds are for. Still, I think Hallmark may be on to something. Their new Journeys line of cards looks to address such diverse and sensitive issues such as cancer, rehab, infertility, depression and coming out. You know, situations that just call out for a canned show of support penned by a complete stranger. Hallmark cards for people with cancer have rhymes like: Cancer is a villain who doesn't play fair ... but it can't dim your spirit, and it can't silence prayer and a more jaunty: One year free of the Big Bad C.
These cards may be more effective than they appear at first glance. I know if I was a smoker, the threat of getting one of these cards would be enough to make me quit cigarettes for good. I was one of your "scores,"
And for that, I say "thanks,"
Maybe he'll be drug and disease free. Cover copy: So, you've decided to end it all . . . Inside copy: Maybe you're right. By the way . . . I'm a "top." And it seems like your world has been turned upside down. Know that it's not your fault. She took advantage of you. And I'm glad that you're my friend. Hey, do you think she'd be up for a three-way? I can hardly wait for the musical e-cards . . . .